Everyone wants students to have a good experience in school. 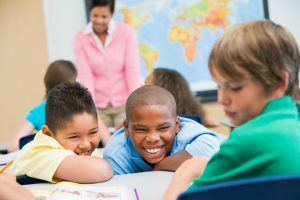 Often part of this desire by families is for their child to not feel singled out as ‘different.’ While it is true that our students are just ‘normal kids who happen to be hard of hearing or deaf’, it is also true that having a hearing loss means that they will be different in some ways from their peers. There are actions that can be taken to reduce the social and self-esteem consequences of being a ‘one and only’. Next PostNext Learning Progress Equal to Peers?